1:00 p.m. to 4:00 p.m. ~ Panel discussion for the Petite Masters tasting and culinary session, from 1:00 p.m. to 2:15 p.m.
2:15 p.m. to 4:00 p.m. ~ Walk-Around Tasting with 25 member wineries. CIA at Copia will list the event to the public at a ticket price of $65 per person, which includes panel, tasting, and walk-around reception. There are only 75 people maximum for this event. If the panel ticket becomes sold out, an additional ticket type will be added to the public listing for the “Walk-Around Reception Only,” at a price of $45. There will be an additional 150 attendees maximum. CIA chefs are again providing paired foods, to complement the wineries’ rich, dark Petite Sirahs. Vendor Fee for walk-around tasting is $200.00 ~ Payable to PSILY online. For any additional people/tickets for each person to pour, contact Jo Diaz at jo@diaz-communications.com for special arrangements. Both opportunities quickly sold out last year. 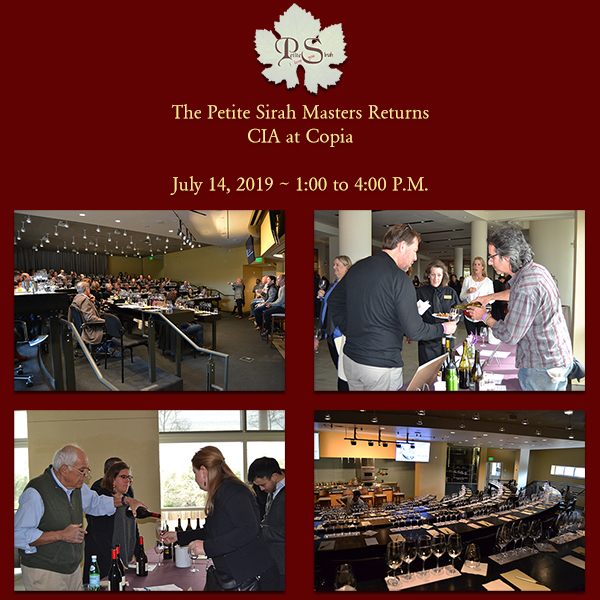 If you’re interested, with current dues paid, you’re again invited to join another fabulous Petite Sirah celebration. Sign Up and Payment deadline is Friday, May 3, 2019. The educational organization, dedicated to Petite Sirah.